Ameer Choudrie is a British Actor who trained at Guildford School of Acting (GSA Conservatoire), England. Born in Henley-on-Thames, Oxfordshire and growing up in Reading, Berkshire, Ameer currently spends his time in London. Whilst training, he performed in a range of Theatre Workshops from Classical Shakespearean works to Modern 20th Century Texts. Upon leaving GSA, Ameer began his path of being a Professional Actor featuring in a number of commercials from becoming the face of Tilda Basmatti Rice in 2007 to featuring in larger brand adverts such as Lycamobile, Vodafone and Walkers Crisps. He also appeared in the Music Video for the Kaiser Chiefs song “Meanwhile Up In Heaven”. Ameer’s TV credits have varied from background to featured appearances in reconstructions for ITV News, Bentley Productions hit television series “Ultimate Force” working with Director Laurence Moody, to making a guest appearance on “Cloud 9”, the first British-Asian soap opera on Sky and Virgin TV. 2018 saw Ameer working with Rifco Theatre Company on a rehearsed reading and workshop piece from one of the Rifco Associates, ending with a showcase to Industry Professionals as part of the British Asian Festival at Watford Palace Theatre. He also flew to Prague to film a commercial for savage promoting Ooredoo, the leading telecoms provider in Qatar, leading up to the World Cup. At the end of the year, Ameer filmed the Cadbury’s Christmas Commercial by Knucklehead and is the featured Allotment Man for their Secret Santa campaign. The commercial was seen across all mediums from social media, tv and the cinema. 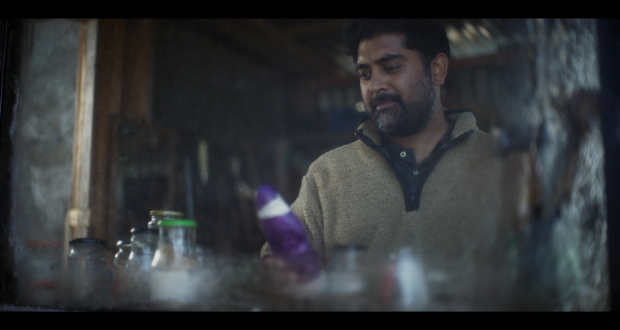 So far in 2019, Ameer has filmed and featured in two commercial campaigns; one for easyJet / VisitBritain, the other for Shell. He has also played the role of a Doctor for a short film called “Nurse” produced by the Bournemouth Film School. Alongside acting, Ameer is currently training for his Masters in Applied Theatre at The Royal Central School of Speech and Drama.